In Houston, Diversity You Can Sink Your Teeth Into Forget the old stereotypes. 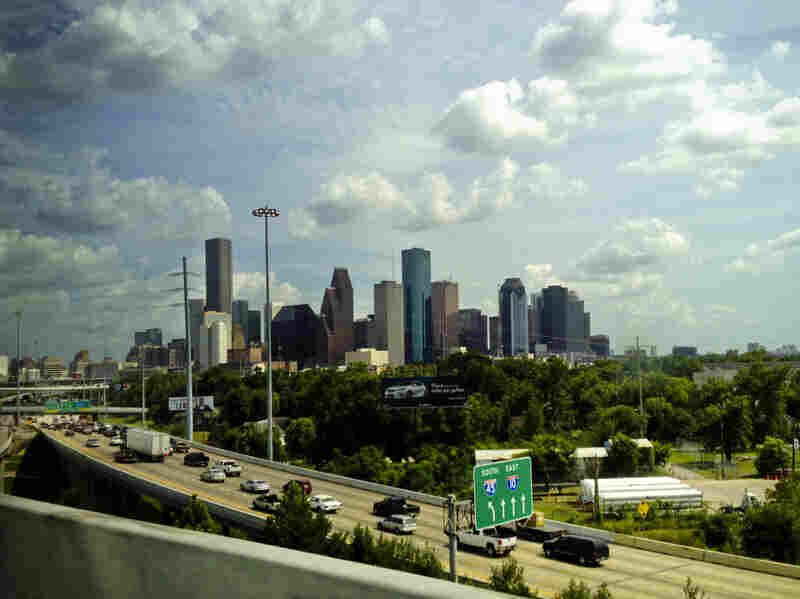 Today's Houston is a fast-growing mash-up of color, culture and ethnicity. One of the most visible signs of the city's metamorphosis is in its dynamic food scene. Africans, Mexicans, Asians and African-Americans migrating north to south are all adding to the melting pot. An in-depth look at the demographic changes that could reshape the political landscape in Texas. Chef Anita Jaisinghani owns Pondicheri, a casual spot serving up her take on the street foods of her native India. Stephen Klineberg polishes off a spicy lamb mint burger, mops his brow and recalls the Houston he moved to as a young professor in the 1970s. "It was a deeply racist, deeply segregated Southern city," he says; an oil boomtown of black and white Americans. There were no restaurants like Pondicheri, where Houston chef Anita Jaisinghani's hip take on Indian street food — and the air conditioning's battle with 100-degree heat — conspire to make the Rice University professor sweat. Houston back then was about steakhouses and Tex-Mex, smog and concrete. It was where bilingual meant English and Spanish, and staggeringly wealthy white oil men had the run of the place. That image of this city of more than 2 million remains amber-fixed in the minds of most outsiders. It was true back then; now, it's almost all wrong, though energy remains king. Boomtown Houston circa 2013 is a fast-growing mash-up of color, culture and ethnicity. The metro area of 4 million-plus people has been transformed into one of the nation's most diverse, seeding down-the-road political implications for deep-red Texas. And nowhere, with the exception of city schools that count more than 80 native languages among their students, is the metamorphosis more visible than in Houston's dynamic, nationally recognized food scene. The image of Houston as a booming oil town persists in the minds of outsiders, despite a vibrant surge of diversity. The vibrancy, driven by diversity and entrepreneurs taking advantage of cheap commercial space, is about more than being able to buy lemongrass and kaffir lime leaves at the local market. Houston, after all, has had a small but growing Vietnamese community since the city opened its arms to refugees after the fall of Saigon in 1975. Now, Africans and Latinos, Asians from more than two dozen countries, and African-Americans migrating back South from North, are fueling a melting pot food scene that speaks volumes about the new Houston. "We are a free people, and we come from everywhere," says Klineberg, who has tracked the transformation for three decades with an exhaustive annual area economic and demographic survey. "This," he says, before heading out into a sweltering midday, "is where the American future is going to play out." Justin Yu, the son of immigrants from Hong Kong and one of Houston's most celebrated young chefs, pulls up a chair for lunch at his favorite restaurant. Himalaya is not on Westheimer Road, a near-downtown stretch chockablock with inventive restaurants, including Underbelly, where a fixture on the menu is Korean braised goat with savory dumplings the size of Tootsie Rolls. Yu's spot of choice is west of Houston, in a seemingly endless parade of buff-colored strip malls known as Little India. The table fills with plates of curries, biryani and a chicken chargha. Yu, whose own menu at Oxheart includes Texas olive oil mousse and tartare of smoked beef leg with kombu aspic, introduces Himalaya chef-owner Kaiser Lashkari as his "food hero." Justin Yu, one of Houston's celebrated young chefs (right), outside Houston's Himalaya Restaurant with owner Kaiser Lashkari. "Houston is a place where you can come and be yourself, to start something on your own," says Yu, whose family settled in California before heading to Texas. "It's easier to integrate into the community here." It was here his dad made his money after the oil bust of 1982. The crash devastated Houston — 1 out of every 7 jobs was lost — but it gave non-white investors a big opening in the commercial real estate market. It was also here where a teenaged Yu would cross the highway from his family's upscale community into Mexican and Korean neighborhoods to play video games and snack on the foods of those cultures. Yu's food has been shaped by those experiences, he says, as well as by his love of the high-acid, herbaceous Vietnamese cuisine that he also grew up with. At Himalaya, Pakistan-born Lashkari, like Yu, incorporates influences of other local communities into the dishes he serves to his multicultural clientele. His brisket masala? A nod to Texas barbeque, he says. And his Indian-style crawfish pays homage to the Cajun cooking favored by many of the nearly 200,000 Katrina refugees who came to Houston in 2005. "You need to give something new to the people," says Lashkari, part of the Indian and Pakistani community that began to take root in Houston in the mid-1980s. "You cannot go on and on and on and on with the same thing," he says. "Unless it's a Coke or a hamburger." The married couple ladle bowls of sweet-and-sour soup with catfish and serve plates of water spinach, beef with lemon and catfish in a clay pot. Over a table crowded with bottles of hoisin, Sriracha and vinegar, they share iconic stories of how they became part of Houston's flourishing Vietnamese community. 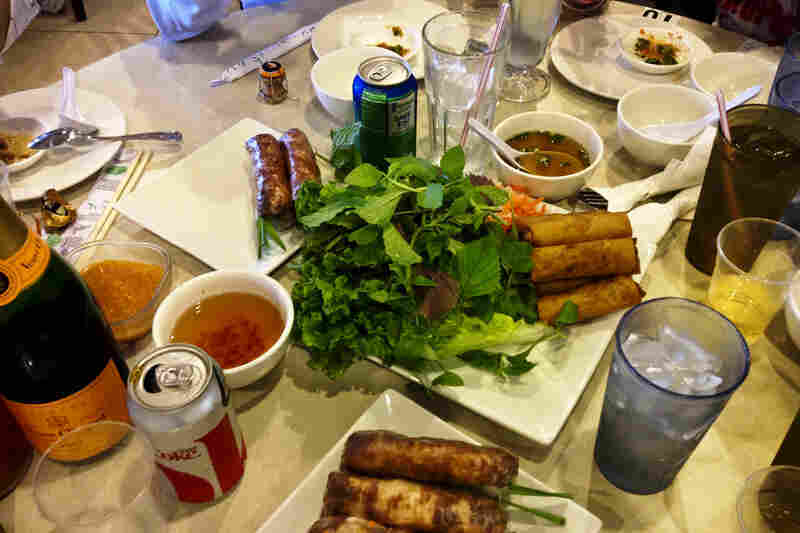 A family-style meal at Thuan Kieu Com Tam, a cash-only, BYOB Vietnamese restaurant in Houston's Chinatown. Pham was 2 years old when she and her family were evacuated by helicopter from the roof of the American Embassy in Saigon. One of Ngo's earliest memories was of living in refugee camp in North Carolina, where Vietnamese families needed to choose a city to sponsor them. "All of the elders were sitting a room, looking at a newspaper that featured a picture of the Astrodome and the headline, 'Eighth Wonder of the World,' " he says. "That's why they decided to come here. That's why they picked Houston." Pham, a food writer and host of a food segment on local television, says the spread at Thuan Kieu Com Tam is as "real as it gets." A true taste of Southern Vietnamese cooking, she says, in a brightly lit, cash-only Houston standby. But for all the talk of food and diversity in the growing city, Pham points to a continuing reality: "There's very little ethnic food representation inside the loop, though we're starting to see it infiltrate." The offerings in India Town, Chinatown and the Long Point area — peppered with Korean, Vietnamese and Mexican restaurants — are still foreign to many Houstonians. So much so that those locals are the ones snatching up tickets to city-sponsored, chef-hosted, culinary bus tours. The biggest tourist attraction in Houston remains Joel Osteen's Lakewood Church, known as America's largest place of worship and located in an arena where the Houston Rockets used to play. The Astrodome, that symbol of old Houston and money and innovation, sits unused, its future uncertain. And though the city still certainly boasts its share of white-tablecloth restaurants, and a few kolache shops that speak to the city's European heritage, the energy is in the new and unexpected taste and diversity of Houston. 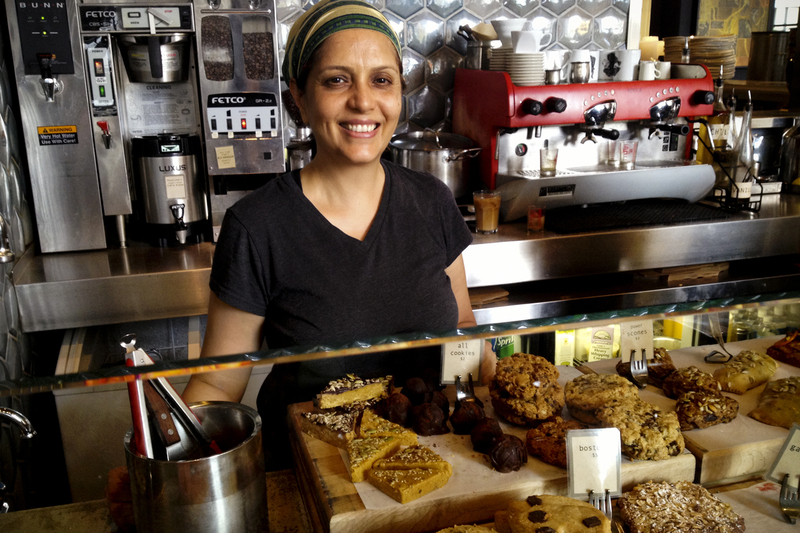 "When I first came to Houston, I thought it was a wasteland," says Pondicheri owner Jainsinghani. "Fast-forward to a different culture." Plus, she says, "I love the weather."